Is it too soon to move to 802.11ac? You're not seeing things. It really does look that ugly. It's fast though. The latest generation of wireless networks - 802.11ac - offers a lot of potential, with transfer speeds of up to 867Mbps with a single 5GHz antennae and wider coverage. While a stream of wireless AC routers have been brought out, most devices still have built-in 802.11n adaptors. 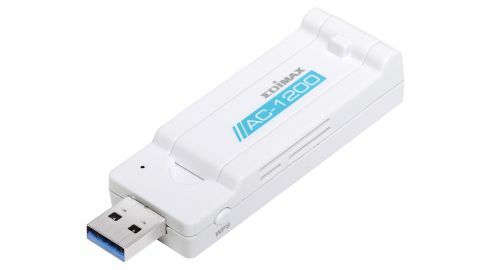 USB adaptors that enable you to connect to the wireless AC networks have come out, but they've been rather hamstrung by the fact that they use USB 2.0, which doesn't have the bandwidth to make full use of the increased wireless speeds. The Edimax Wireless AC Adapter EW-7822UAC, however, is the first USB 3.0 AC1200 adaptor. Edimax has a reputation for producing ugly, yet functional, network devices for businesses - a reputation that it is trying to shake off. With the EW-7822UAC that reputation isn't going to be challenged any time soon. If you've got a nice sleek laptop or tablet, having the EW-7822UAC poking out of the side could spoil the aesthetics somewhat. But that's not what this device is for - it's about getting the fastest speeds out of the newest technology. So how well did it perform? In our tests we sent a 100MB file between a PC with the EW-7822UAC to a laptop connected via Ethernet to a Belkin AC1200 DB router. Uploading and writing the file to the remote PC saw speeds of 83.43Mbps, while downloading the file from the other PC had speeds of 106.06Mbps. For the sake of comparison the Belkin AC Wi-Fi Dual-Band USB Adaptor - which is only USB 2.0 compatible - reached download and upload speeds of 80.2Mbps and 93.81Mbps respectively. Wireless AC is still in its infancy, so we hope to see an improvement in speeds - especially with USB 3.0 devices - in the future. Unless you need the newest tech going, however, we recommend you hold tight for now.